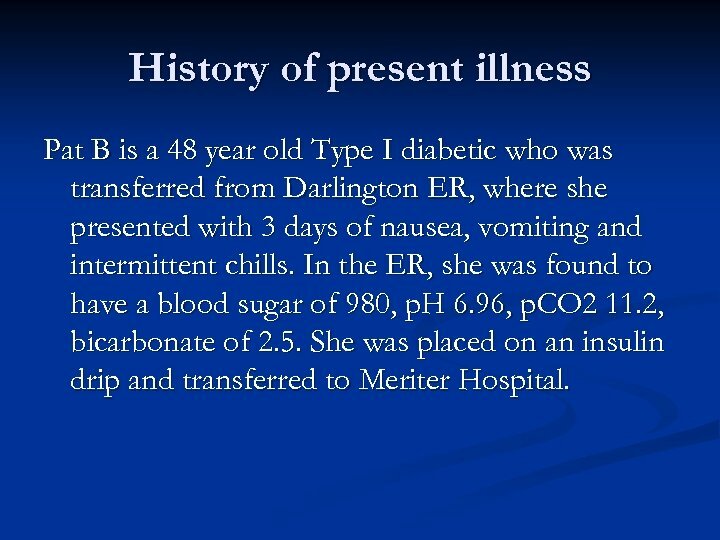 History of present illness Pat B is a 48 year old Type I diabetic who was transferred from Darlington ER, where she presented with 3 days of nausea, vomiting and intermittent chills. In the ER, she was found to have a blood sugar of 980, p. H 6. 96, p. CO 2 11. 2, bicarbonate of 2. 5. 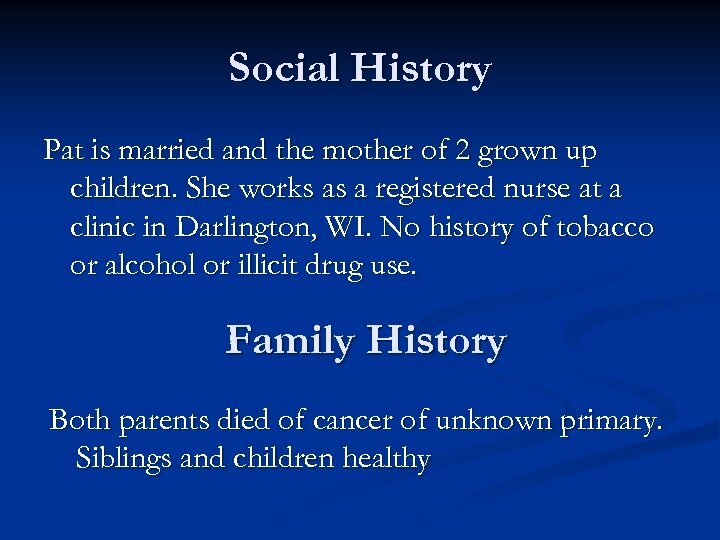 She was placed on an insulin drip and transferred to Meriter Hospital. 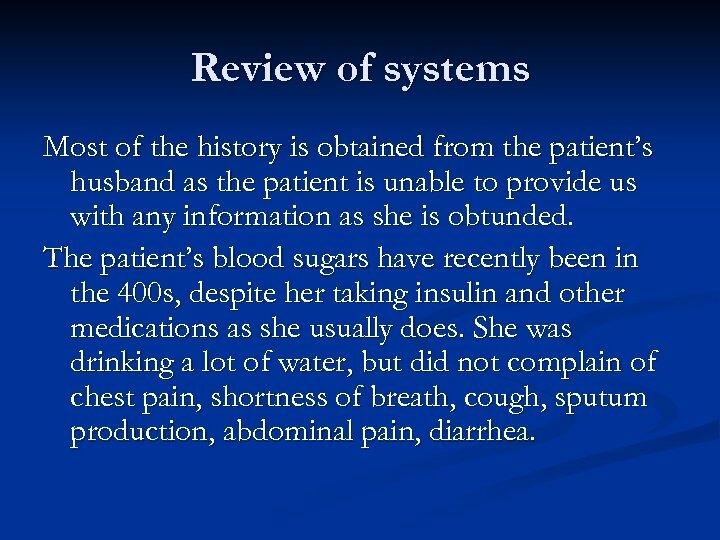 Review of systems Most of the history is obtained from the patient’s husband as the patient is unable to provide us with any information as she is obtunded. The patient’s blood sugars have recently been in the 400 s, despite her taking insulin and other medications as she usually does. She was drinking a lot of water, but did not complain of chest pain, shortness of breath, cough, sputum production, abdominal pain, diarrhea. 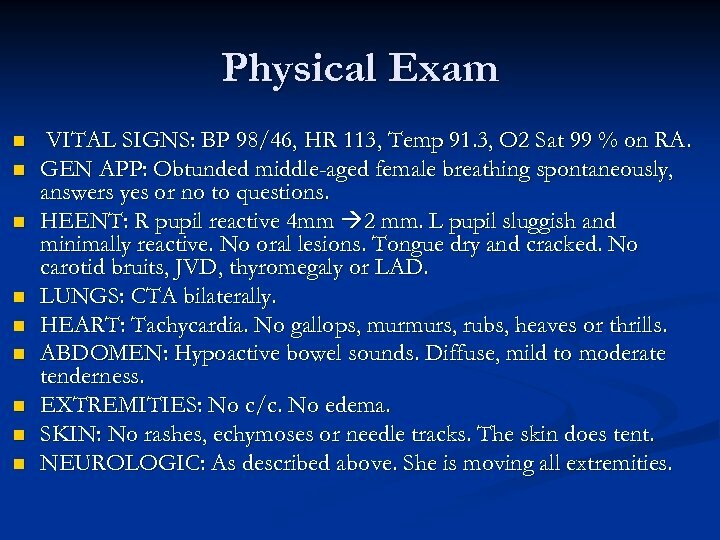 Physical Exam n n n n n VITAL SIGNS: BP 98/46, HR 113, Temp 91. 3, O 2 Sat 99 % on RA. GEN APP: Obtunded middle-aged female breathing spontaneously, answers yes or no to questions. 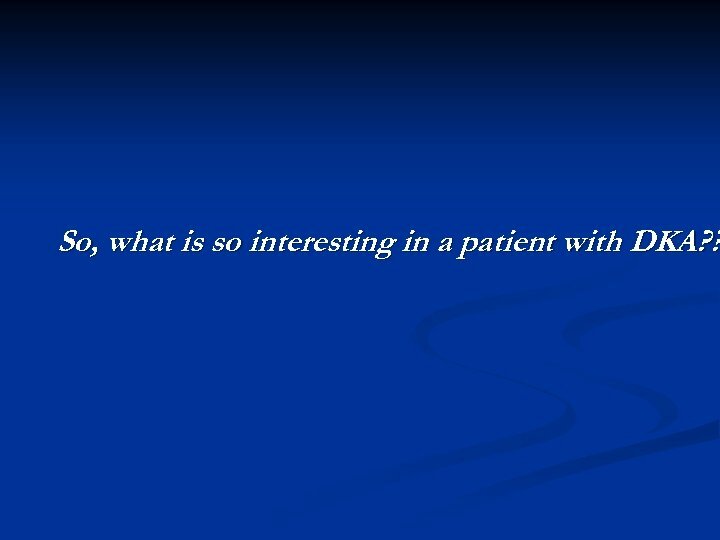 HEENT: R pupil reactive 4 mm 2 mm. L pupil sluggish and minimally reactive. 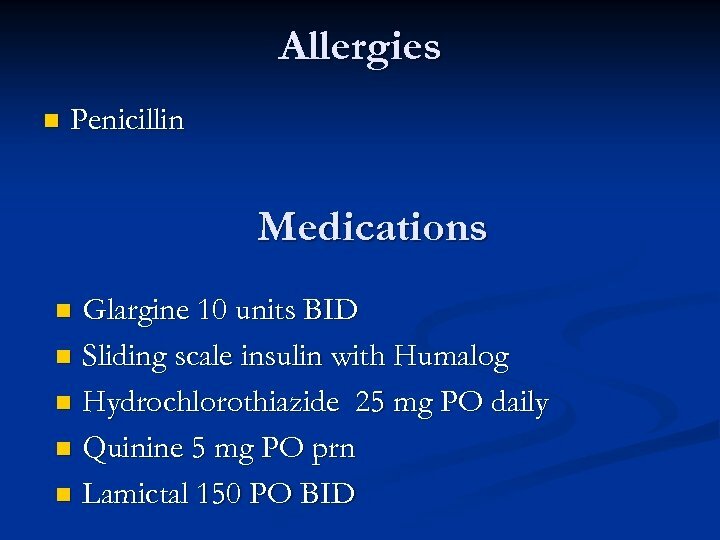 No oral lesions. Tongue dry and cracked. 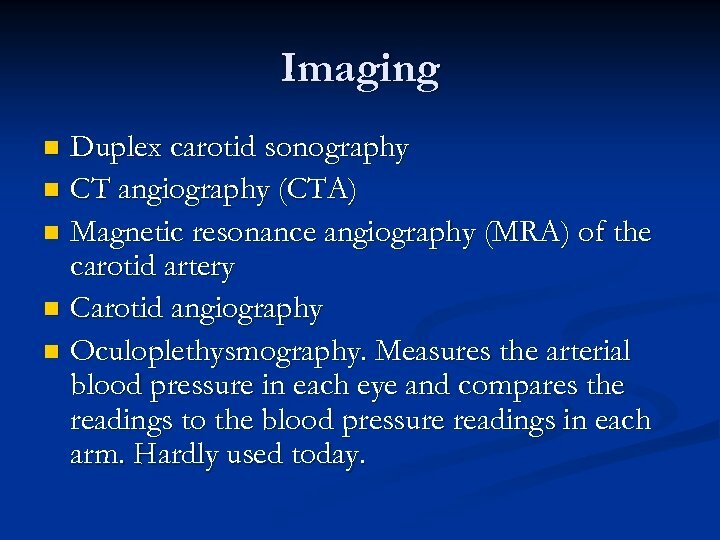 No carotid bruits, JVD, thyromegaly or LAD. LUNGS: CTA bilaterally. HEART: Tachycardia. No gallops, murmurs, rubs, heaves or thrills. ABDOMEN: Hypoactive bowel sounds. Diffuse, mild to moderate tenderness. EXTREMITIES: No c/c. No edema. SKIN: No rashes, echymoses or needle tracks. The skin does tent. NEUROLOGIC: As described above. She is moving all extremities. 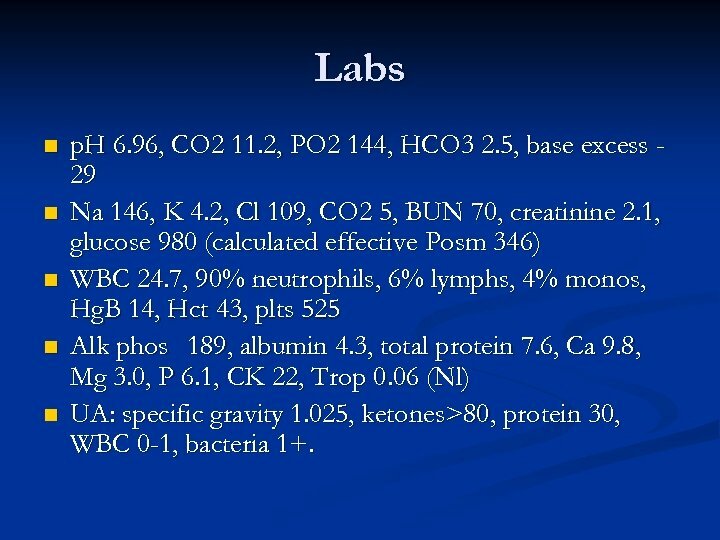 Labs n n n p. H 6. 96, CO 2 11. 2, PO 2 144, HCO 3 2. 5, base excess 29 Na 146, K 4. 2, Cl 109, CO 2 5, BUN 70, creatinine 2. 1, glucose 980 (calculated effective Posm 346) WBC 24. 7, 90% neutrophils, 6% lymphs, 4% monos, Hg. B 14, Hct 43, plts 525 Alk phos 189, albumin 4. 3, total protein 7. 6, Ca 9. 8, Mg 3. 0, P 6. 1, CK 22, Trop 0. 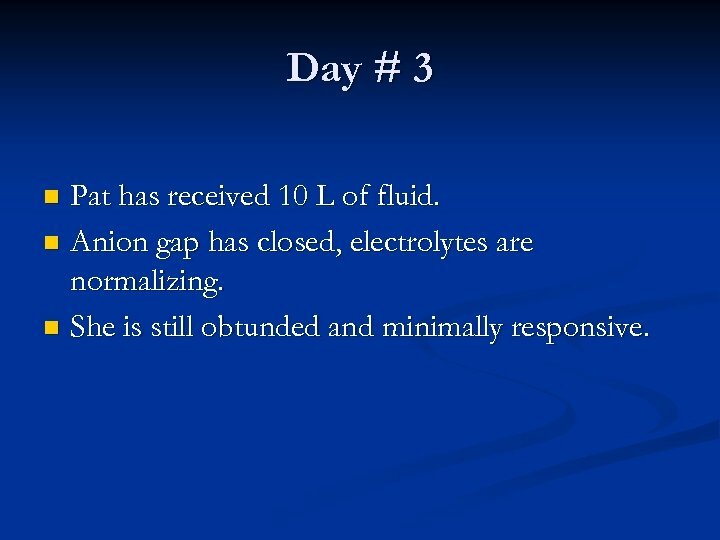 06 (Nl) UA: specific gravity 1. 025, ketones>80, protein 30, WBC 0 -1, bacteria 1+. 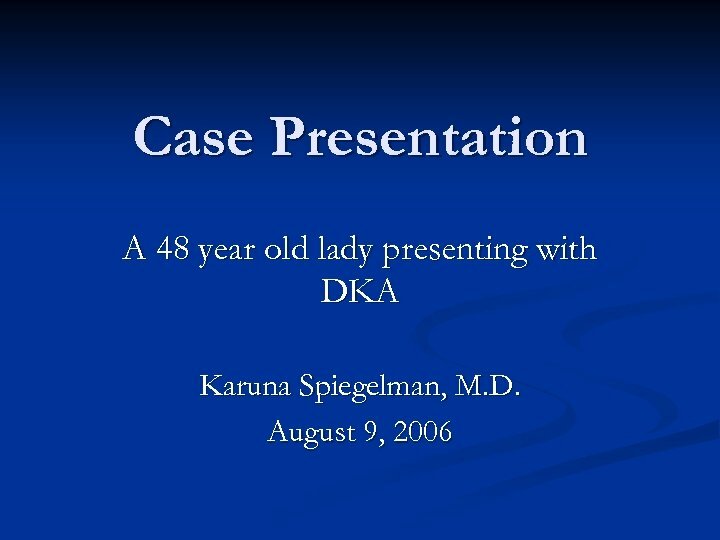 So, what is so interesting in a patient with DKA? ? 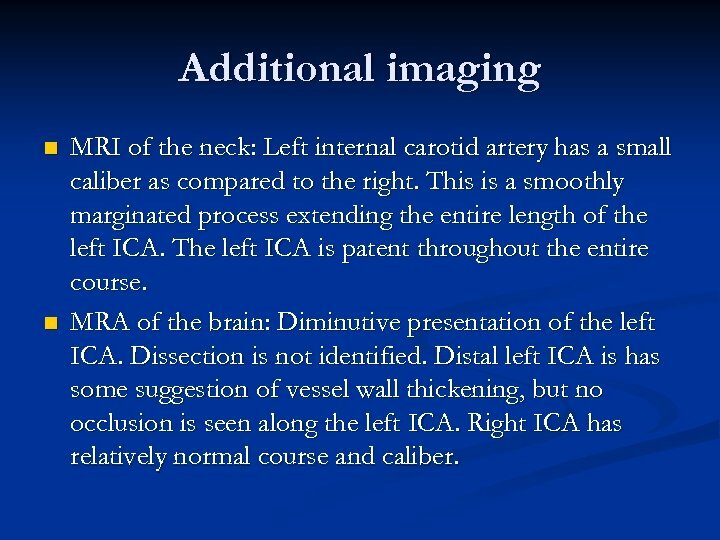 Additional imaging n n MRI of the neck: Left internal carotid artery has a small caliber as compared to the right. This is a smoothly marginated process extending the entire length of the left ICA. The left ICA is patent throughout the entire course. 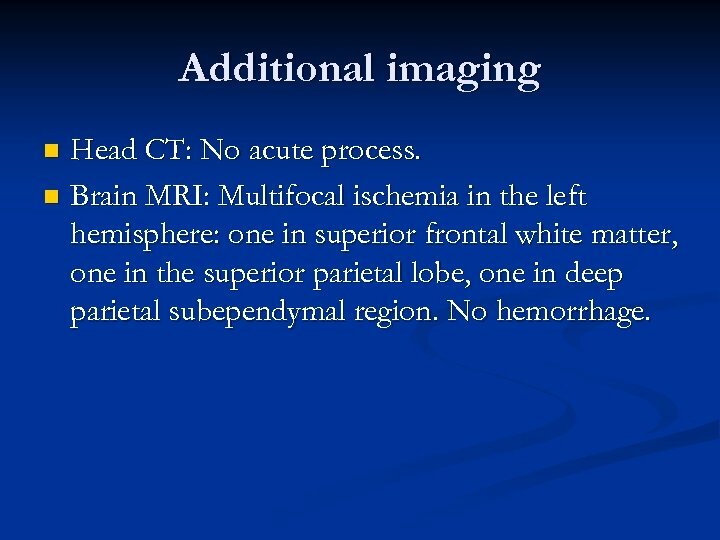 MRA of the brain: Diminutive presentation of the left ICA. Dissection is not identified. 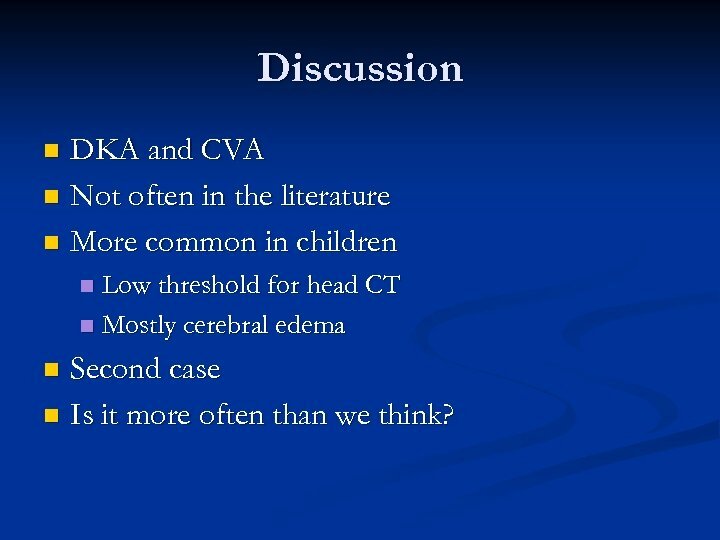 Distal left ICA is has some suggestion of vessel wall thickening, but no occlusion is seen along the left ICA. Right ICA has relatively normal course and caliber. 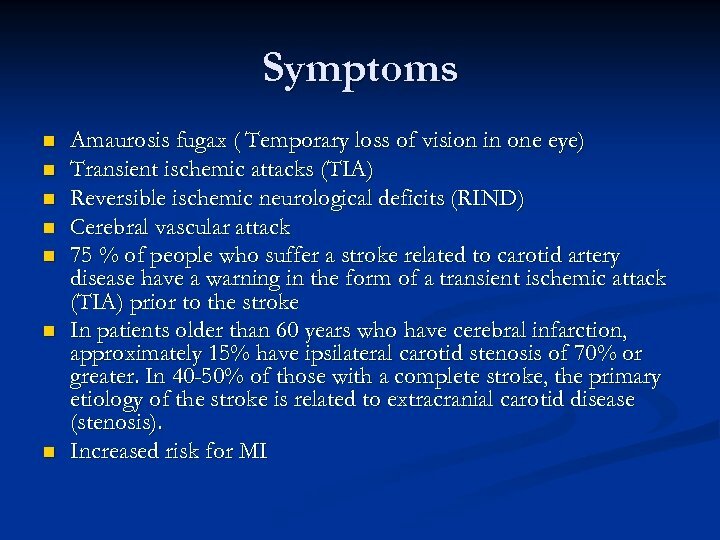 When to treat n n n Symptomatic with 70 % stenosis. Carotid artery repair reduces the 2 year risk of stroke from 26% to 9% Symptomatic with stenosis of 50 -70% - still benefit from repair. 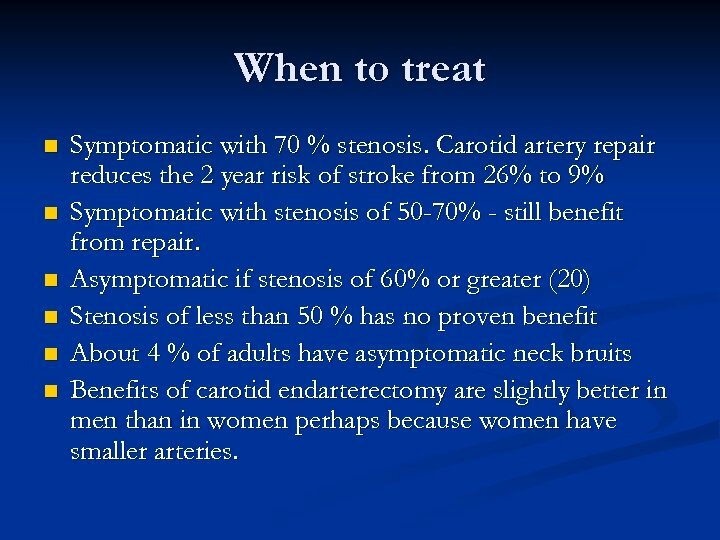 Asymptomatic if stenosis of 60% or greater (20) Stenosis of less than 50 % has no proven benefit About 4 % of adults have asymptomatic neck bruits Benefits of carotid endarterectomy are slightly better in men than in women perhaps because women have smaller arteries. 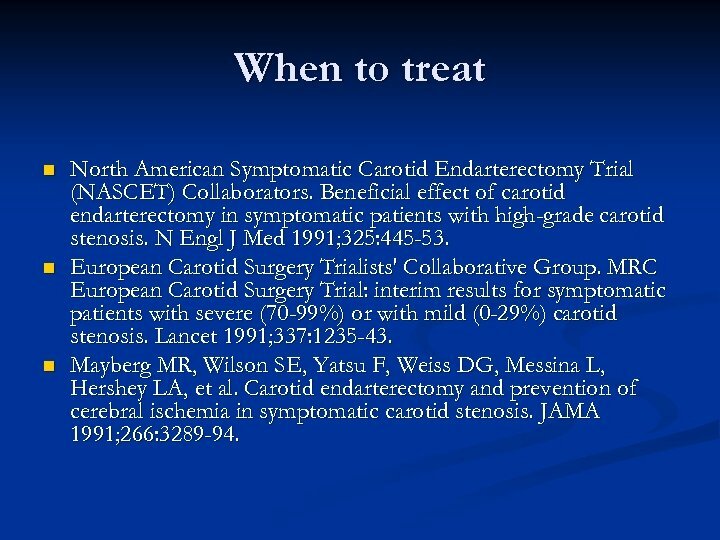 When to treat n n n North American Symptomatic Carotid Endarterectomy Trial (NASCET) Collaborators. 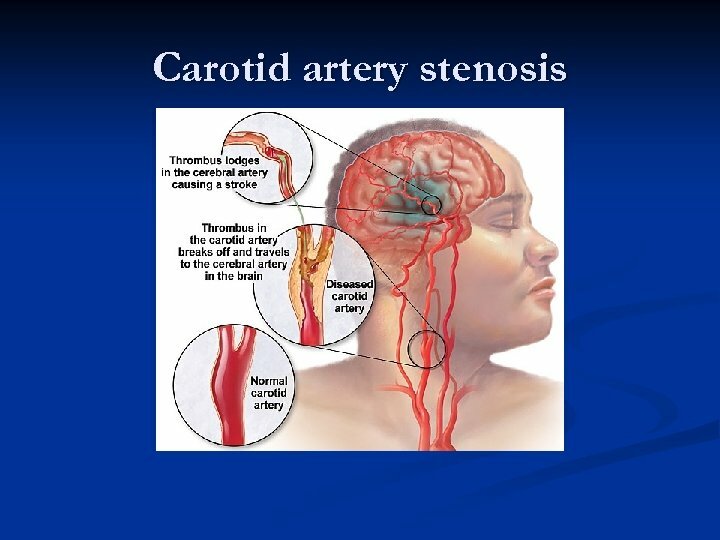 Beneficial effect of carotid endarterectomy in symptomatic patients with high-grade carotid stenosis. N Engl J Med 1991; 325: 445 -53. European Carotid Surgery Trialists' Collaborative Group. MRC European Carotid Surgery Trial: interim results for symptomatic patients with severe (70 -99%) or with mild (0 -29%) carotid stenosis. Lancet 1991; 337: 1235 -43. Mayberg MR, Wilson SE, Yatsu F, Weiss DG, Messina L, Hershey LA, et al. Carotid endarterectomy and prevention of cerebral ischemia in symptomatic carotid stenosis. JAMA 1991; 266: 3289 -94. 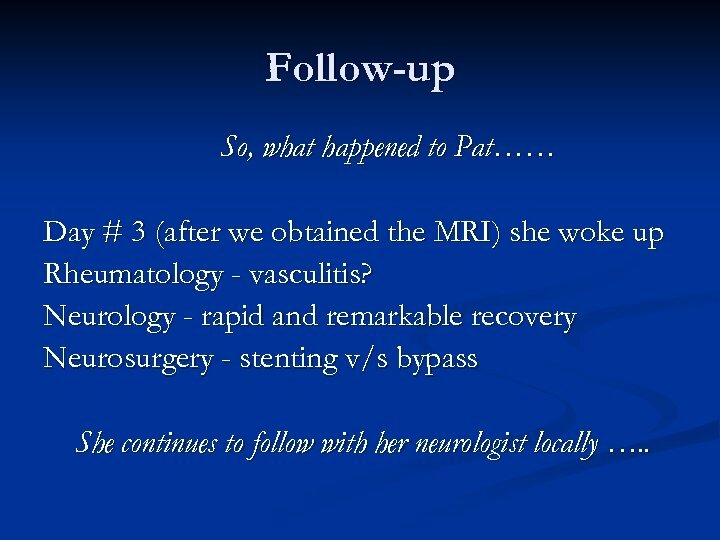 Follow-up So, what happened to Pat…… Day # 3 (after we obtained the MRI) she woke up Rheumatology - vasculitis? Neurology - rapid and remarkable recovery Neurosurgery - stenting v/s bypass She continues to follow with her neurologist locally …. .
References n North American Symptomatic Carotid Endarterectomy Trial (NASCET) Collaborators. 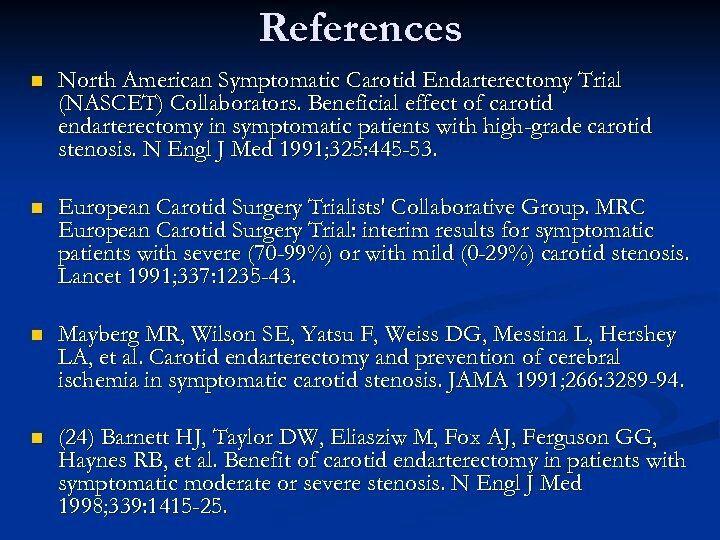 Beneficial effect of carotid endarterectomy in symptomatic patients with high-grade carotid stenosis. N Engl J Med 1991; 325: 445 -53. n European Carotid Surgery Trialists' Collaborative Group. MRC European Carotid Surgery Trial: interim results for symptomatic patients with severe (70 -99%) or with mild (0 -29%) carotid stenosis. 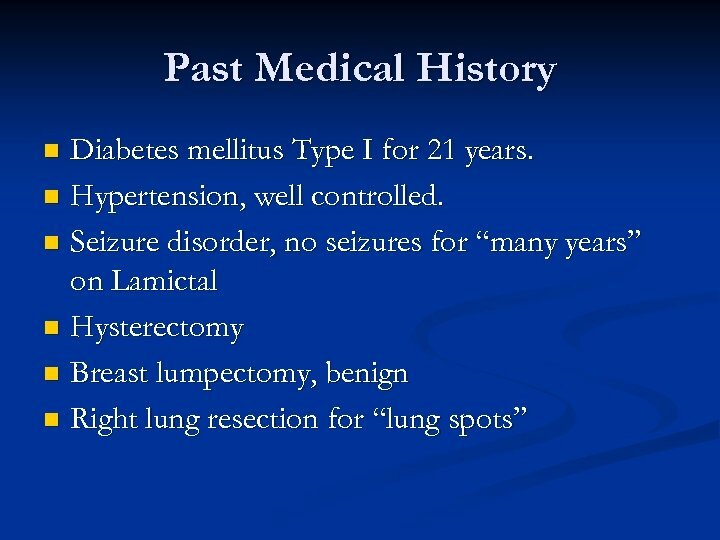 Lancet 1991; 337: 1235 -43. n Mayberg MR, Wilson SE, Yatsu F, Weiss DG, Messina L, Hershey LA, et al. Carotid endarterectomy and prevention of cerebral ischemia in symptomatic carotid stenosis. JAMA 1991; 266: 3289 -94. n (24) Barnett HJ, Taylor DW, Eliasziw M, Fox AJ, Ferguson GG, Haynes RB, et al. 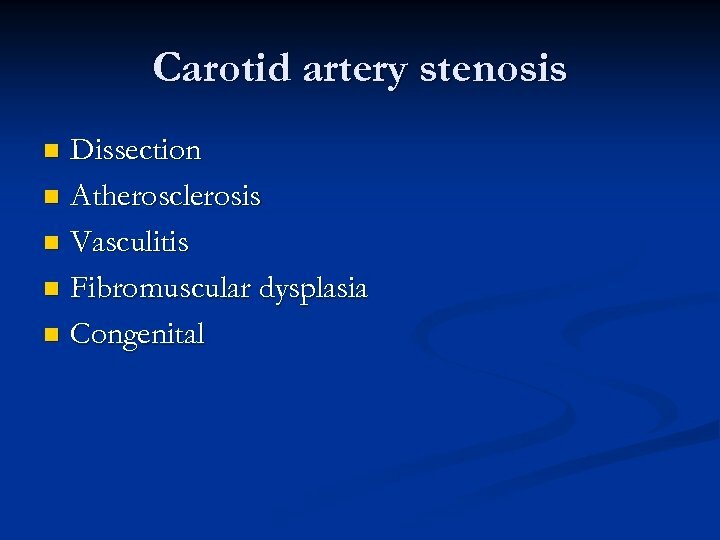 Benefit of carotid endarterectomy in patients with symptomatic moderate or severe stenosis. N Engl J Med 1998; 339: 1415 -25. 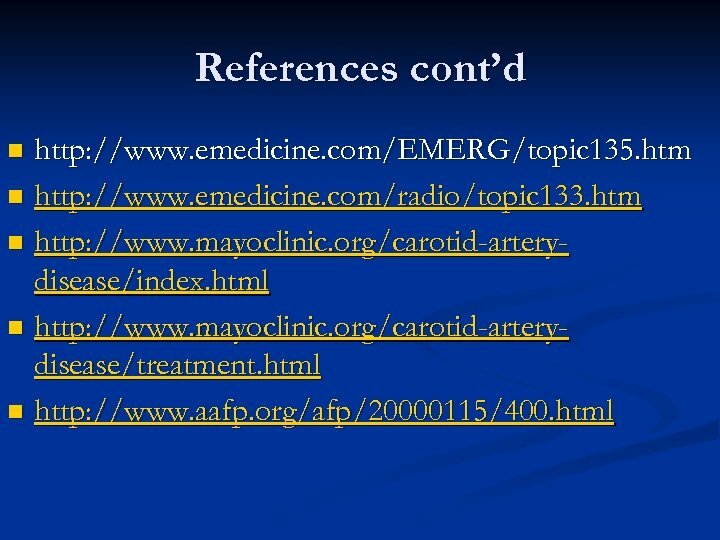 References cont’d n CASANOVA Study Group. 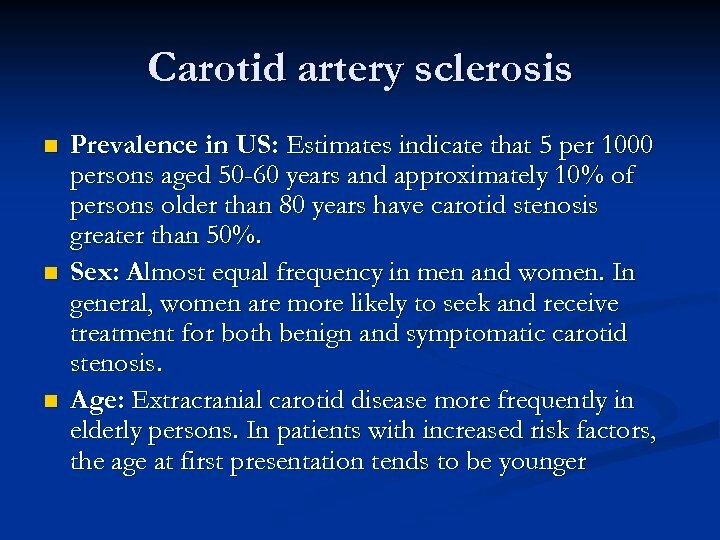 Carotid surgery versus medical therapy in asymptomatic carotid stenosis. Stroke 1991; 22: 1229 -35. 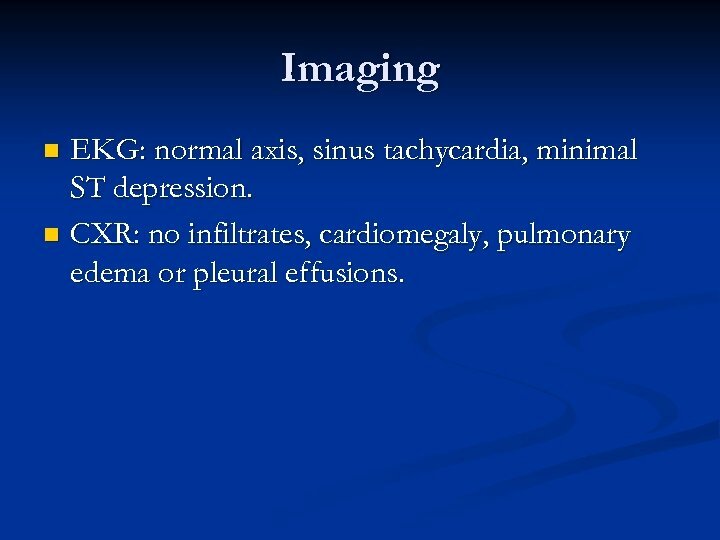 Mayo Asymptomatic Carotid Endarterectomy Study Group. Results of a randomized controlled trial of carotid endarterectomy for asymptomatic carotid stenosis. Mayo Clin Proc 1992; 67: 513 -8. n Hobson RW 2 d, Weiss DG, Fields WS, Goldstone J, Moore WS, Towne JB, et al. 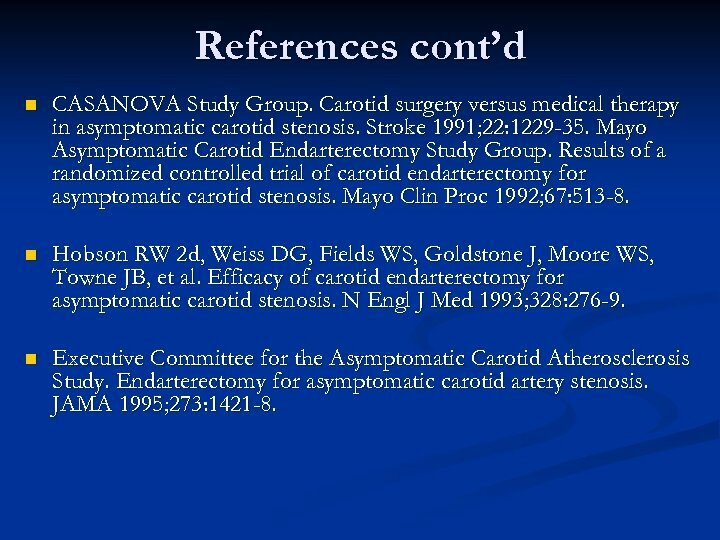 Efficacy of carotid endarterectomy for asymptomatic carotid stenosis. 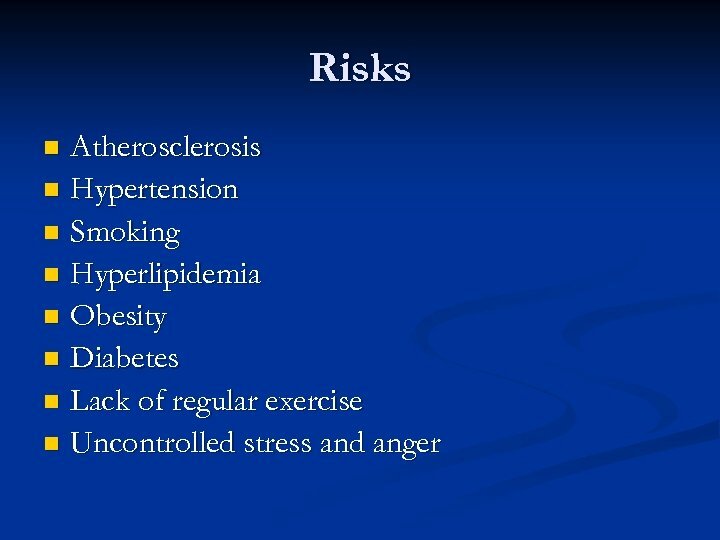 N Engl J Med 1993; 328: 276 -9. n Executive Committee for the Asymptomatic Carotid Atherosclerosis Study. 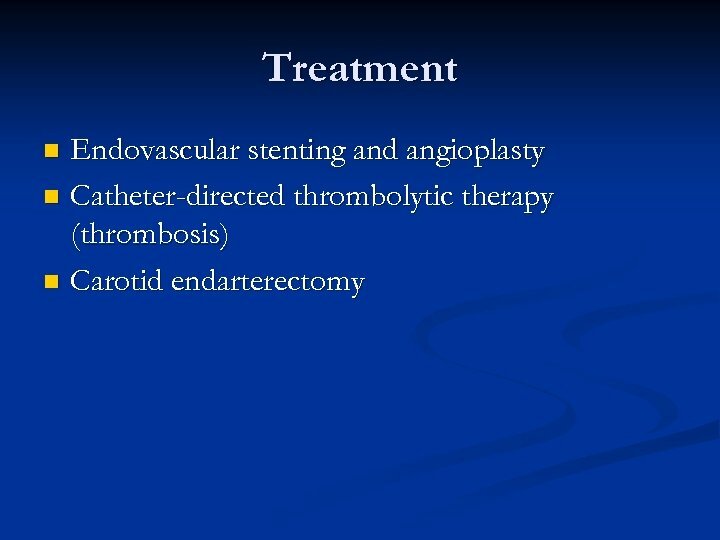 Endarterectomy for asymptomatic carotid artery stenosis. JAMA 1995; 273: 1421 -8.